Children are constantly asking questions. While their first words are often greeted with parental cheers, children’s incessant queries can quickly become tiresome for parents and caregivers. Responding to the constant “why’s” of toddlerhood can be exhausting. But it’s important to pay attention to these questions, as they reveal to adults what children know, and what they want to know. Research has shown that 3-year-old children are interested in finding out all about the objects and creatures they encounter. When shown a photo of an unfamiliar animal, such as a platypus, they may ask “What does it eat?” or “Where does it live?” And as any parent knows, 3-year-olds ask about a wide variety of topics, adjusting their questions to suit the situation. Seeing an unfamiliar animal, they may ask about its habitat and diet, but when shown a novel object, such as a turkey baster, they might want to know, “What do you use it for?” While a question like this may seem mundane, it reveals a recognition that the turkey baster is a tool. Children’s questions reflect their knowledge; by paying attention to questions, we learn what children understand about a topic. Questions can also show us what children have yet to learn. In our lab at the University of Delaware, we looked at the types of questions children asked about geometric shapes. We were interested in whether 3-year-old children, who ask spot-on questions about animals and artifacts, would also ask relevant, defining questions about shapes. 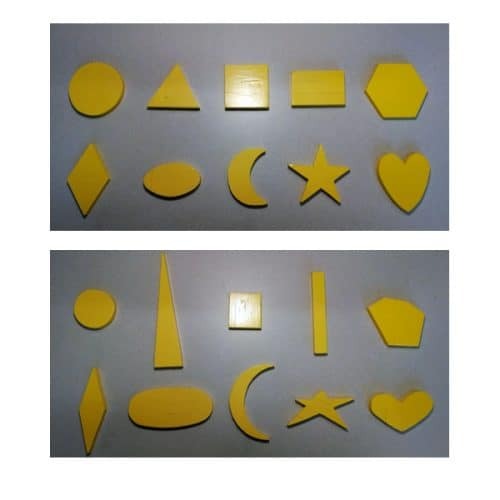 Understanding the defining features of shapes is especially challenging for children. While they may easily recognize an equilateral triangle as a triangle, for example, they may have more difficulty classifying a scalene triangle as a triangle. Children may think that the defining feature of triangles is having three equal sides, rather than being a closed form with three angles, regardless of the length or symmetry of the sides. They often fail to recognize isosceles triangles as real triangles even in the last years of elementary school. To learn more, our lab invited parents and children to play with painted wooden shape toys for 10 minutes while we recorded their interactions. We found that not a single child asked about a defining feature of a shape. Instead, they asked mostly about shape names (e.g., “What’s that called?”) and the location of shapes (“Where’s the triangle?”). Parents, similarly, focused on shape names and locations. What can we take away from these results? The main point is not that 3-year-olds do not yet know what features define a certain shape. Instead, the point is that children’s questions matter. By listening to their questions, we can learn what features they consider important in a specific category. If a child is asking only about the name of a shape, for example, it is unlikely that the child has progressed beyond making a connection between a name (e.g., “That’s a square!”) and the shape itself. If they ask no questions about the angles in a shape, they may not fully understand the concept of an angle. The next time your children ask a question, listen to what they’re asking about. On your next visit to the zoo, pay attention to what they ask when they see a parrot, for example. Do their questions demonstrate an understanding of the bird domain? If children ask, “Does it fly?” they are showing that they understand that birds are usually able to fly. When a child asks “What’s it for?” when confronted with an unfamiliar kitchen tool, such as a whisk, the question reveals an understanding that tools have functions. When children do not fully understand a domain, they may limit themselves to asking about names and locations. A child may simply ask, “What’s that called?” when seeing the parrot or whisk. However, research suggests that when children ask things like, “What is it?” they want to know more than just the object’s name – such as its function. Children’s questions can be powerful – provided that answers do more than merely give the name of an unfamiliar creature or object. For parents, questions are a precious opportunity to promote a child’s learning.